French mathematician and military engineer who wrote several works on mathematics and military engineering. His masterpiece is considered to be De la défense des places fortes (1810), the classic work on fortification. 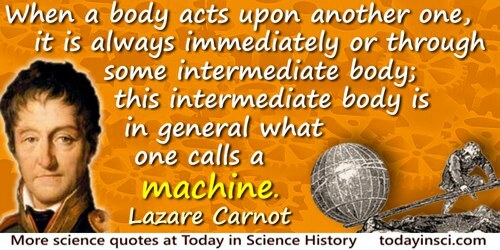 When a body acts upon another one, it is always immediately or through some intermediate body; this intermediate body is in general what one calls a machine. In Essai sur les machines en général (1783), art. 8, as translated by Ivor Grattan-Guinness. 13 May - short biography, births, deaths and events on date of Carnot's birth.